The history of film ratings in the USA is somewhat long and not so pleasant. It pretty much begun with the Motion Picture Production Code, which was a set of industry moral censorship guidelines that governed the production of most United States motion pictures released by the major studios from 1930 to 1968. These guidelines became more popularly known as the Hays Code, after Hollywood’s chief censor of the time, Will H. Hays. Regulation, as is often the case, led to more extreme forms of code and eventually to censorship. But, as is also often the case, ultimately extremes lead to a demise, and in this case, the demise of the code. And so, in the late 1960’s, the strict code was replaced by a system on which the current film ratings are based (there were several modifications done over the years). This brief discussion of the ratings is not so much about its history or the many controversies about the ratings specific films receive. It’s about the ratings themselves. All these years I thought the rating system is intended as a recommendation related to the young viewers: what age is deemed appropriate for watching a specific film. Yet, time and again I went to see films that had PG-13 or even R ratings, and found myself sitting in the audience with young children, including babies and 5-6 years old. When I once went to complain to the cinema manager about it, I was informed that the ratings are just a recommendation and that so long as the kids are accompanies by an adult, they can watch whatever their accompanying adult desire. Rating: PG-13 – Parents Strongly Cautioned, See it with your kids: Some material may be inappropriate for children under 13. 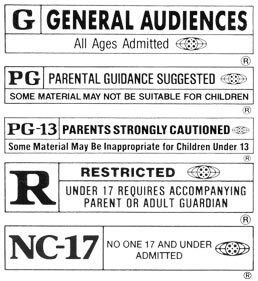 Correct rating: PG-13 – Primitive Glob 13: refers to parents who’s brains never went past the developmental phase of age 13, therefore bringing your young children to films were things explode, catering to their nightmares, is absolutely fine. Rating: R – Restricted, Think before taking your kids: Under 17 requires an accompanying parent or adult guardian. Added on December 2013: click here for study worth reading about violence in PG-13 movies.